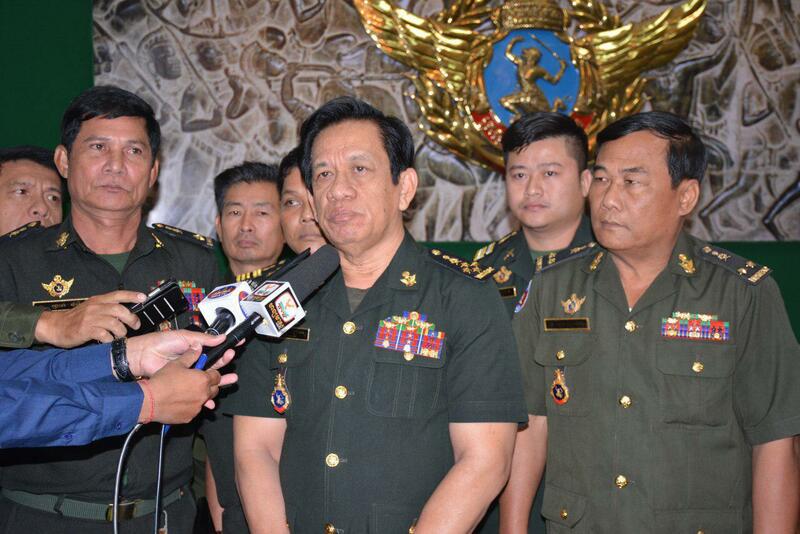 Phnom Penh (FN), Feb. 1 – Spokesman for the Ministry of National Defense Chum Socheat once again rejected a statement of the US Intelligence Community for misleading the national and international public and insulting the independence and neutrality of Cambodia. The reactions came after the US National Intelligence Community issued a statement on the global threat assessment in 2019. Spokesman Chum Socheat said in a statement dated Friday that the US’s global threat assessment clearly reflected a wicked intention to interfere with Cambodian internal affairs, and a serious insults to the kingdom‘s independence and permanent neutrality. "Cambodian people loves peace that is so difficult to attain. We will never violate our constitution that would lead to disorder,” the spokesman stated. “Cambodia does not have any reasons to allow foreign bases on her soil as accused by the US” he added. Socheat urged the US to stop baseless accusations against Cambodia; and to respect Cambodia's sovereignty and independence. 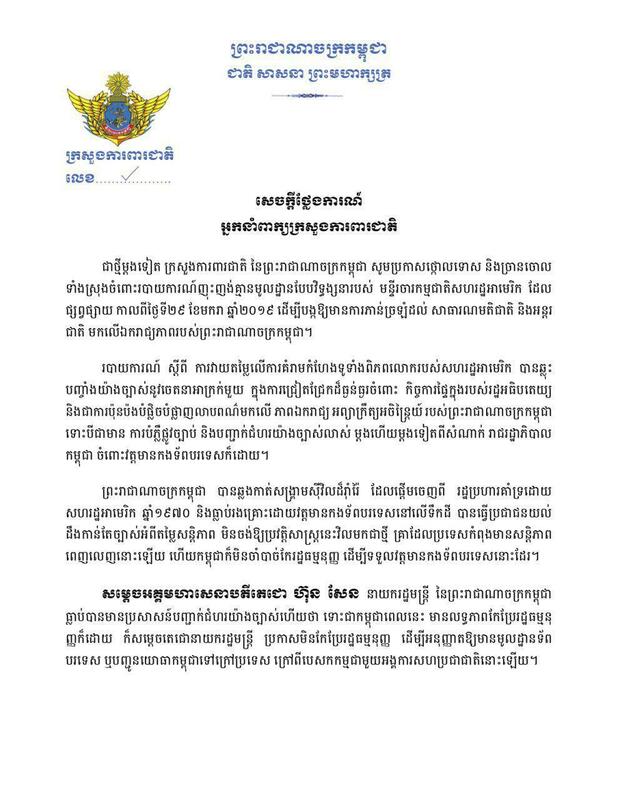 Article 53 of the Cambodian Constitution stipulates that the Kingdom of Cambodia shall not permit any foreign military base on its territory and shall not have its own military base abroad, except within the framework of a United Nations' request. Speaking in the Council of Ministers’ plenary session in late 2018, Prime Minister stated that, "I would like to reaffirm that since 1989 until now, there is no foreign troops in Cambodia. As a matter of fact, foreign troops entering Cambodia from 1991 to 1993 was under the UN peacekeeping operations in Cambodia […] In Cambodia, I recognize that there are foreign troops but they are military attaché at respective embassies; there is no foreign troops for combat." 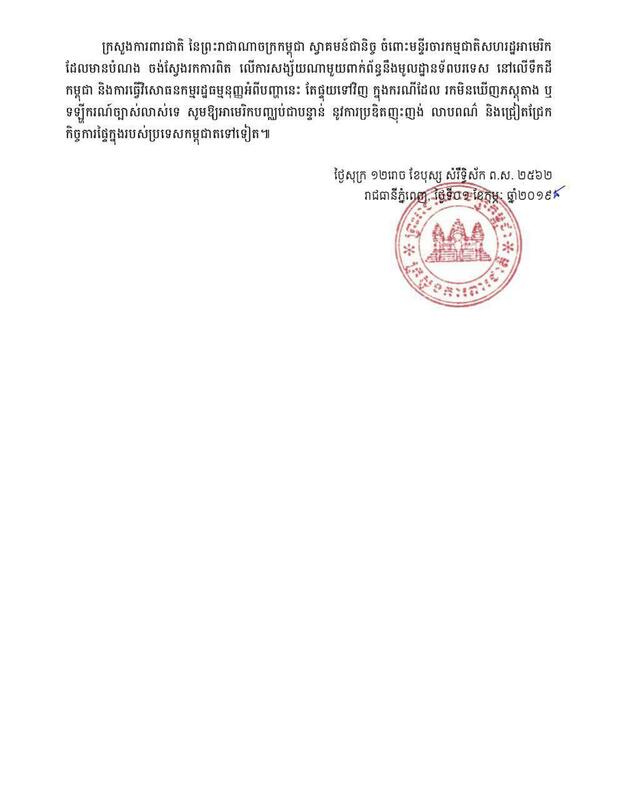 Cambodia does not allow foreign military base on her soil, regardless of army, navy, or air forces, the premier continued. The premier urged the US not to kill or harm Cambodia again and reassured that it is Chinese investment at the coast, not military base. "Now we have satellite observing from above, do you see we set up a submarine base? In fact, there is no need for Cambodia to buy a submarine, so no submarine base,” the premier added.